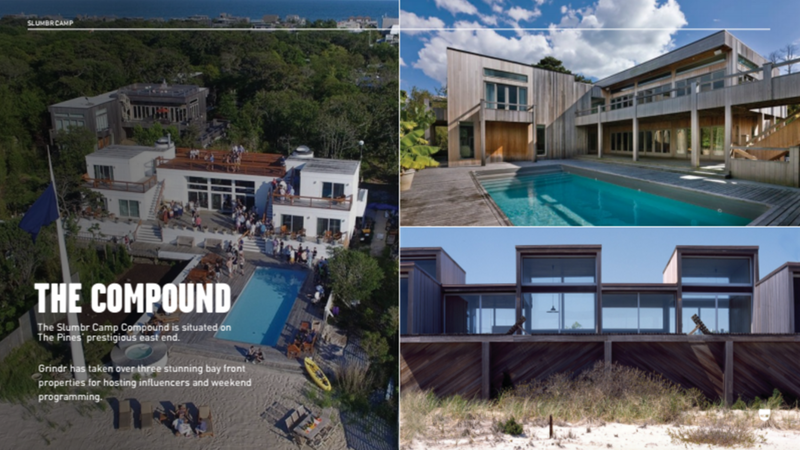 Grindr, with Visionaire World, is taking over The Pines on Fire Island, an iconic gay summer destination known for it's famous denizens, unique architecture, and total lack of cars, to throw the gayest, campiest and most fun sleepover ever. They'll be inviting 500 of New York's most influential personalities for a Pride Weekend celebration featuring round the clock activities and experiences perfect for brand activations. Featured in Vogue, Out, The New York Observer, Paper and Purple magazine, Slumbr has become a media attracting adventure which has received praise and coverage for changing the mold of Pride celebrations. Guests will shop the Slumbr Camp Store which can be stocked with co-branded products including Sleeping Bags for Two, Short Shorts + Tanks, Flip Flops + Swim Trunks, Condoms + Lube, Toys and more. Create co-branded product with Grindr. Grindr is the number one app for gay, bi and curious men. Their media site INTO reaches over 2 million readers monthly. VisionaireWorld is the most respected publication in high fashion. Past guests have included Zachary Quinto, Alexander Wang, Sophia Bush, Ellen von Unwerth, Hari Neff, Gigi Gorgeous, Olympian Gus Kentworthy, Andy Cohen, editor Hamish Bowles, The Fat Jew and the Brant brothers.